A couple of posts ago, I wrote that snow in March never lasts long. I was wrong. Slowly, slowly, it is now starting to melt, but is still a foot or so deep in the shady parts of the garden where it drifted in the strong easterly wind. Where the daffodils break through the snow, the sun-warmed air reaches into the hole they have made and melts the snow round each plant. Spiky bulb leaves do this, but flatter slow growing plants, such as cushion saxifrages, must wait. 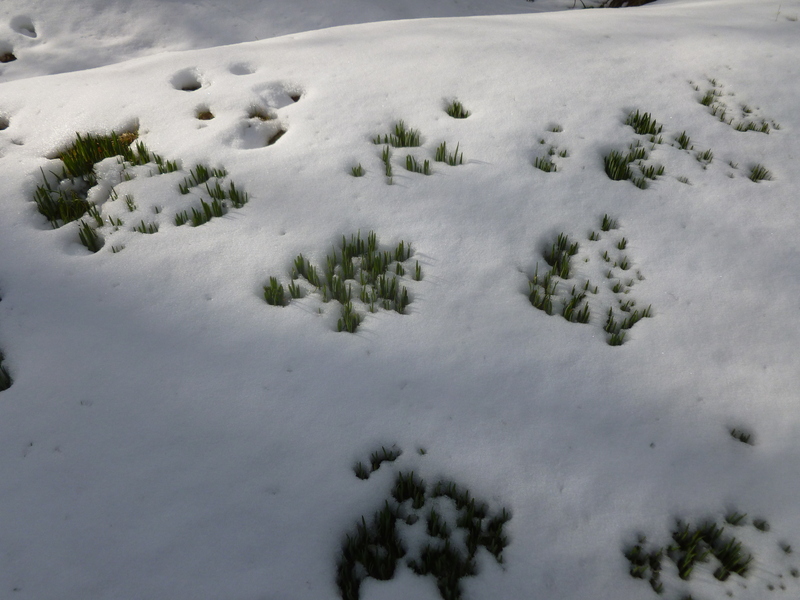 My scree bed lies under a cold blanket, except where a rabbit has passed – the sun widening out its tracks, so that it looks as if a gigantic Easter bunny has visited . Since I constantly moan about warm, wet, winters and premature warmth in March, I’m actually happy with all this. It’s exactly what alpine plants need. Of course it is frustrating not to be barrowing compost and splitting blue poppy plants and all the other jobs that are now queuing up, but because of the cold and the snow, it’s less likely that May frosts will wipe out all the young growth, as happened last year. 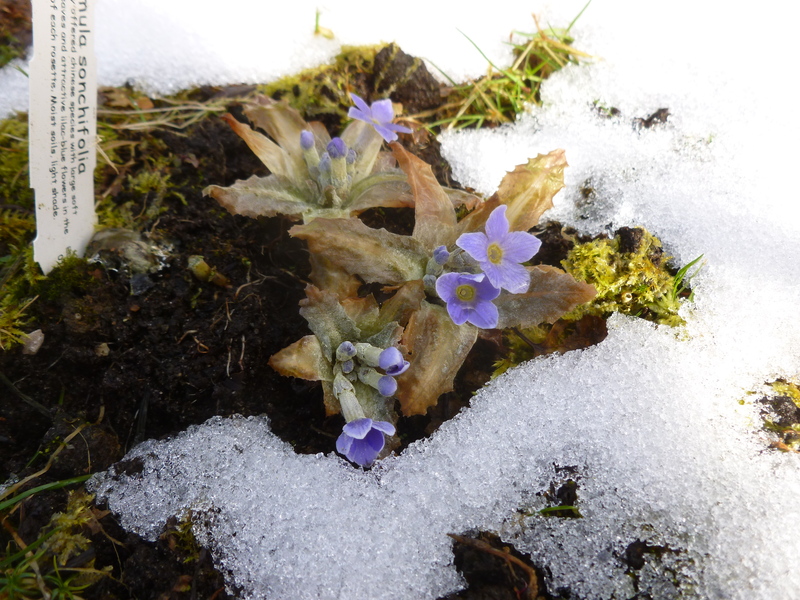 And, where the snow melts, the early primulas rush into flower. Here is p.sonchifolia, breaking out of its resting bud and eagerly putting out its blooms before bothering to grow a stem . As you see, the leaves have suffered badly from frost. It’s an irony that many high-altitude primulas can be easily frost-damaged – the snow cover in their native mountains normally keeps them safe. Unfortunately, in Scotland the snow melted before the frosts were past. Such is life. 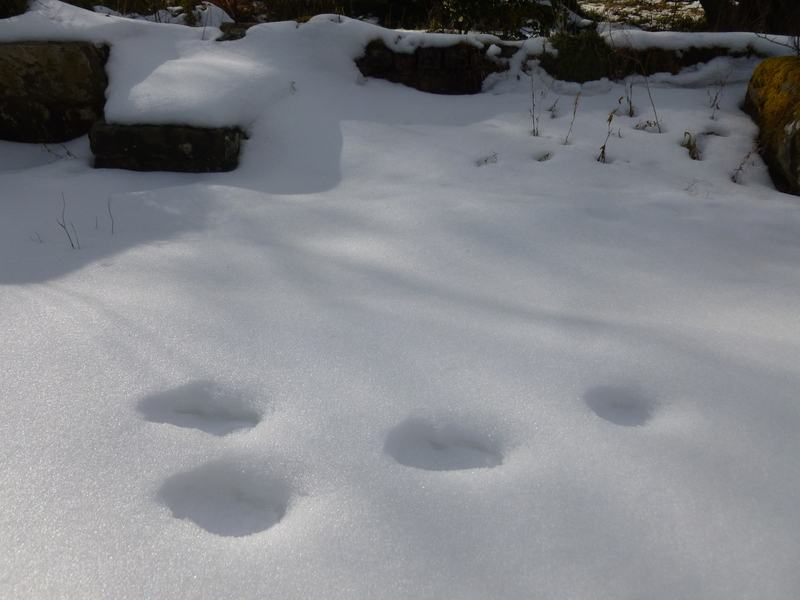 This entry was posted in Gardening in Scotland, primula, snow, spring flowers and tagged primula sonchifolia, rabbit tracks, snow by kininvie. Bookmark the permalink. I didn’t know there were blue primulas – it’s beautiful. It’s almost blue – but probably better described as very pale lilac. Varies a lot though, and you can find some that really would qualify. Yes, I had such a horrible time last year with everything being frosted, that I’m really quite pleased with the cold weather….but not for too much longer. So glad your snow is finally deciding to slowly melt. While your plants have stayed nice and warm under their duvet, ours have just shivered in the freezing wind. The ground is rock hard with the frost so no planting or splitting has been done for weeks now, surely spring must arrive soon! We too have blue primulas, but different varieties from yours, I’m sure yours will soon put out new leaves and look as they should, Happy Easter to you and your family Kininvie. And to you, Pauline. What blue primulas do you have? I’m VERY interested to know… So strange that Devon of all places, should be frozen solid in April! I never really used to like primulas; perhaps it is just that I always associated them with my paternal grandmother whose garden style was – to be frank – rather twee, even though she had a 3000 square meter farm garden with views of open fields. Also, with regards to the daffs… I’ve been trying to google around to see if daffodils are capable of thermogenesis, as that might be another explanation why they are able to make their way through the snow. Snowdrops are, I know, but Google will tell me nothing about daffs. I wouldn’t know about the daffs – but I doubt under normal circumstances they have quite the same need to generate heat – they are, after all, about a month later than snowdrops. As for primulas – they are one of the largest families, and you will have to start picking among all the different kinds. I imagine what put you off were rows of lurid polyanthus bedding plants, but life with primulas can be much more interesting than those. Go and have a look at the website primulaworld (linked in the sidebar) for a first taster. We have the cold wind too, Helen. The difference between this year and last is astonishing. I shall post some ‘before’ and ‘after’ pictures. Good heavens Kininvie, you are still in snow banks in April! I’m glad you find it more comforting than worrying about later frost ambushes. I do think a bloom seems romantic and bravely beautiful when surrounded by ice or snow. I thought of you yesterday when I saw the first hummingbird among the red currant blooms and I had no camera. We may get smacked back in April too but it’s been a warm week and you’ll be glad to hear the ferns are unfurling like mad. O please photograph a hummingbird for me! It wouldn’t be as good as the real thing of course. So pleased to hear of your unfurling ferns. But that’s all they do really, isn’t it? Just hang about for most of the year and then unfurl. A very primitive plant, if you ask me. Tall rocks are primitive and you like THEM. Kininvie, I also am always banging on as to how the snow never lies long in March. Its all gone now and the sun is shining, looks like Spring until you go outside. Like others, I am also very taken with p.sonchifolia. You’ll probably be able to get hold of a p.sonchifolia fairly easily Alistair, if you want to try one. I’d be interested to hear how it does with you. Love watching the progress of your garden, your photos are quite lovely. So glad the snow is melting for you, it really has been quite a miserable winter/spring hasn’t it. Such a pretty primula you have there.